1. Trim the piece of tuna slightly so it is shaped liked a cylinder, (rolling it will also shape it). Roll in the black pepper and wrap tightly in plastic wrap, rolling into a round shape and twisting ends of plastic wrap tightly to keep round shape. Refrigerate for at least 1 hour before slicing. 1. Whisk scallion, lemon juice, lime zest, tamari, sesame oil and toasted black sesame seeds together and set aside. 1. Unwrap chilled tuna cylinder. Slice thinly. 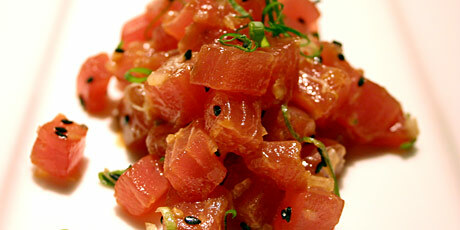 Arrange 3 to 5 slices of tuna carpaccio on each chilled plate. 2. Drizzle the carpaccio with the Sesame Lime Dressing and garnish each plate with cilantro, a twist of cracked pepper and some root chips.